The first big electronic music festival in Dominican Republic adds Magda, Nick Curly, Mirko Loko, Alexi Delano, Dirty Flav, Djerry C and Tavo to the 18 names already announced. ●The event will take place from 19th to 21st of April, during Easter Week, and will have also a great selection of activities to offer. Born under the shelter of YET Records, MEET! is the first big electronic music festival that has chosen the paradisiacal location of Punta Cana as its home. The fact is that this project that promises to be an international reference is much more than a festival, it appears as the perfectmeeting point for professionals, labels, artists, brands, audience and latest music trends of the scene. A few days ago MEET! revealed some details about its first edition such as it will take place during Easter, specifically from 19th to 21st of April, in Chozza and Onno, two of the most innovative places you can currently find in the Caribbean island. 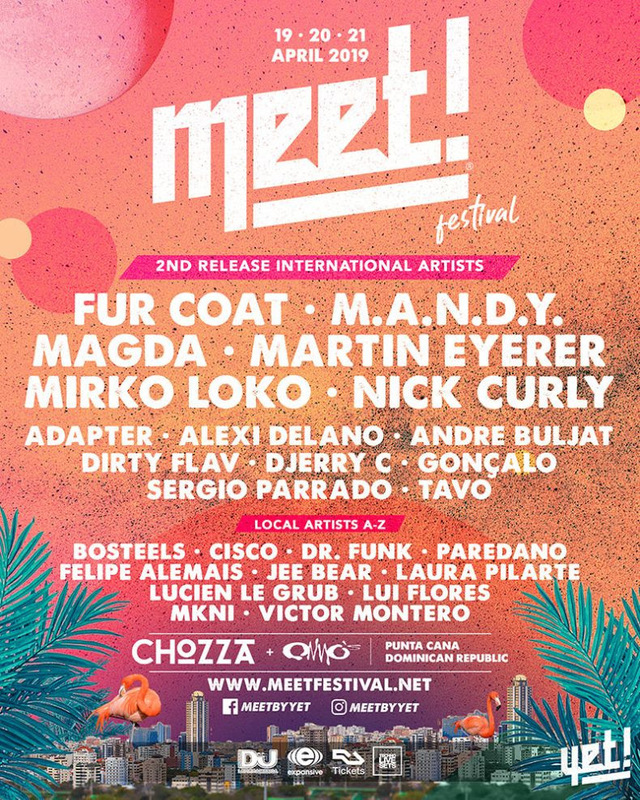 It also revealed the first confirmations of its line-up with names such as M.A.N.D.Y., Fur Coat, Martin Eyerer, Sergio Parrado, Gonçalo, Adapter and André Buljat. Now, MEET! keeps revealing the numerous attractions that its proposal gathers, adding 8 new names that goes from big classics of the contemporary electronic such as the Polish DJ Maga or the Chilean Alexi Delano, to references of the last decade such as Nick Curly or Mirko Loko, passing by emerging talents such as Dirty Flav, Djerry C and Tavo. A second line-up announcement that is creating an extraordinary musical offer for this first edition of the festival. And that’s not all, because MEET! will put particular emphasis on the development of the production just as on the creation of a selected offer of alternative activities for the audience among which we can find daytime beach parties, a gastronomic area and free access to Aquapark.